Sports-related facial soft tissue injuries are not uncommon. [1, 2, 3, 4, 5, 6, 7, 8, 9, 10] The position and anatomy of the face make it particularly vulnerable to trauma. In addition, few sports mandate the use of protective equipment, leaving the face susceptible to injury. Although most such injuries are minor in nature, they should be evaluated promptly with a focused history and thorough examination. In addition, facial injuries should be treated early to reduce the likelihood of possible adverse outcomes (ie, infection, loss of function, poor cosmesis). In this article, common sports-related soft tissue facial injuries are discussed, with an emphasis on the initial evaluation, diagnosis, and treatment. The use of protective equipment, such as helmets and headgear, face masks, eye protection (shields or goggles), and mouthpieces are useful in preventing some types of facial soft tissue injuries. Importantly, make sure the rules of the sport allow for the use of such protective equipment before recommending or providing the protective equipment. A focused and thorough history should be obtained from the injured athlete, including his or her pertinent medical history, the mechanism of injury (if not witnessed by the medical staff), and the source of pain. If the patient is unable to report history information, family members can provide such information. The presence of symptoms such as visual changes or altered sensorium should also be ascertained at this time. The face is extremely vascular, and even minor injuries may result in profuse bleeding. Copious irrigation should be used to clean and accurately assess the injury. Visual inspection and palpation should be used to systematically examine the face for symmetry. Start superiorly, with the scalp and frontal bones, and proceed inferiorly and laterally. Examine the oral cavity for any disrupted dentition or lacerations. During inspection, pay particular attention to any areas of swelling because this may indicate a more significant underlying injury. Note the location, size, shape, and depth of any lacerations, and explore wounds for foreign bodies. Palpate for areas of crepitus or bony step-off. Gross asymmetry may signify underlying nerve damage. Assess neurologic function by evaluating sensation and motor function. As with the physical examination, a systematic approach to facial laceration repair ensures the best chance at an optimum outcome. A summary of one methodologic approach follows. Familiarity with the pertinent anatomic aspects of the face is important. Clear anatomic boundaries are present that must be respected and carefully realigned to avoid obvious deformity. Cosmetic results are better when minimal tension is placed on the wound edges at the time of repair. Therefore, wounds with the long axis parallel to the natural skin tension lines have much better cosmetic outcomes. The degree of tension on the wound edges can be estimated by measuring the distance that the wound edges retract away from the center of the lesion. Marked retraction (>5 mm) indicates strong skin tension. With such wounds, placement of dermal sutures in a 2-layer closure should be considered. Anesthesia can be provided by topical, local, or regional block. An advantage of using regional block in the face is that the wound edges are not distorted from the local anesthetic. The areas for regional block injection are shown in the image below. Amide anesthetics (eg, lidocaine, bupivacaine, mepivacaine) are used most commonly. Allergic reactions are uncommon. When using anesthetics containing epinephrine, care should be used to avoid areas with end arteries (ie, the nose). 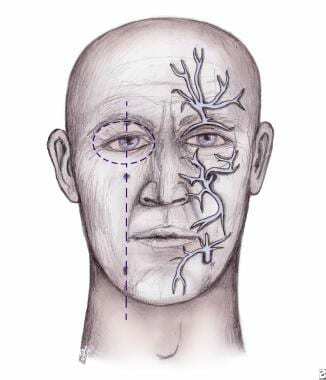 Distribution of nerves for regional anesthesia of the face. All areas should be thoroughly explored, copiously irrigated, cleaned, and débrided of devitalized tissue before closure. Irrigation lessens the risk of infection. Interestingly, regardless of irrigation, noncontaminated wounds repaired within 6 hours of injury rarely develop infection, and the overall rate of infection of repaired scalp and facial wounds is 1%. After irrigation, gentle cleansing of the wound should be performed with a dilute povidone-iodine solution (Betadine; Purdue Pharma, LP, Stamford, Conn) or iodine solution. 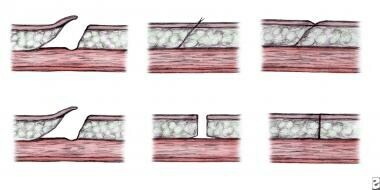 The wound edge (1-2 mm) can be safely removed to rid the area of devitalized tissue. Attempts should be made to make the wound edges perpendicular with the skin surface because this results in a smoother, less noticeable scar. (See the image below). Top: Improper repair of an angled laceration. Bottom: Proper repair of an angled laceration, with creation of perpendicular edges for a flush repair. Steps to repair lip laceration. A 3-layered approach is needed, as depicted. The suture technique should be selected based on the site of the wound and the amount of tension on the wound edges. 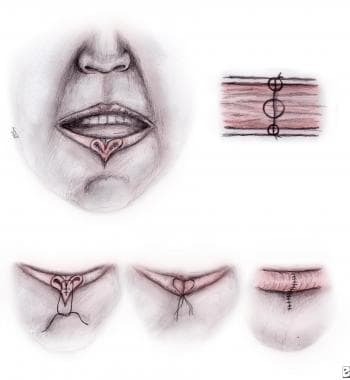 A simple interrupted technique can be used in areas of low tension or in wounds in which the tension has been reduced with a layer of subcutaneous sutures. This technique is also useful for realigning wounds with irregular wound edges. Areas of high tension are best closed using a vertical mattress technique. All facial wounds should be repaired in less then 24 hours to decrease the risk of infection and achieve the best cosmetic result. If a delay in closure is necessary, wounds should be covered with saline-moistened gauze until the repair can be made. Dermal adhesives, such as 2-octyl cyanoacrylate, have been shown to be equivalent to sutures for the repair of simple, clean wounds in areas of low tension. The adhesives are applied topically to the wound edges. Advantages of adhesives include shorter repair time, fewer supplies, less pain during repair, and elimination of the need to remove sutures or staples at a follow-up visit. Note that dermal adhesives should not be used on the lips or mucous membranes; avoid their use in patients with poor circulation or who have a propensity to form keloids. Staples are good alternatives to sutures in the repair of scalp lesions. Stapling involves shorter repair time and less cost compared with suture repairs. Rates of infection and inflammatory response are not higher than those associated with suture repair. During the staple application, an assistant helps to evert and approximate the wound edges, while the primary operator uses the stapler. Disadvantages include the inability to accurately align the wound edges in irregular wounds and an increased likelihood of visible scarring, thus limiting the use of stapling to the scalp. Abrasions are partial-thickness disruptions of the epidermis as a result of sudden, forcible friction. These wounds should be gently cleansed of all debris. Failure to remove all debris can lead to "tattooing" of the skin and a poor cosmetic result. Local or regional anesthetic may be required to keep the patient comfortable and achieve adequate cleaning. Lubrication of the wound using an antibiotic ointment and covering with a sterile bandage may encourage healing. Corneal abrasions result from loss of the surface epithelium. Disruption near the central visual axis interferes with visual acuity. Such abrasions should be treated with a course of ophthalmic topical antibiotics. Topical analgesics may be used initially, but avoid prescribing them to the athlete for home use because this may delay reepithelialization and suppress the normal blink reflex. Emergent consultation with an ophthalmologist is warranted for suspected retained intraocular foreign bodies, and urgent consultation is needed for suspected corneal ulcerations (microbial keratitis). These injuries require close follow-up. Referral to an ophthalmologist should also be made for any athlete with continued pain after 48 hours or inadequate healing by 72 hours. Epistaxis typically does not require invasive treatment. Most often, bleeding can be controlled by maintaining continuous pressure for 10 minutes. This is achieved by asking the athlete to grasp and pinch his or her nose. While this task is performed, have the athlete tilt the head forward to avoid bleeding into the pharynx, which can lead to aspiration. Pressure should be maintained for at least 5 minutes and for up to 20 minutes. If this is unsuccessful, a second attempt should be made. Packing the affected nostril with gauze soaked in topical decongestant may be necessary to achieve hemostasis. If the bleeding site is clearly observed, chemical cautery can be attempted using silver nitrate directly at the site. If bleeding is not controlled despite these measures, the nasal cavity should be packed from posterior to anterior with ribbon gauze impregnated with petroleum jelly. Nasal tampons may also be helpful. For particularly resistant cases, referral to an otolaryngologist may be required. Return to play should be based on the location and severity of the injury, sport and position requirements, and risk of the injury causing a concomitant injury. Most athletes are able to return to play immediately after treatment on the sideline or in the training room. When making return-to-play decisions, attention should be given to whether the area in question can be protected from further injury. Papakosta V, Koumoura F, Mourouzis C. Maxillofacial injuries sustained during soccer: incidence, severity and risk factors. Dent Traumatol. 2008 Apr. 24(2):193-6. [Medline]. ADA Council on Access, Prevention, and Interprofessional Relations; ADA Council on Scientific Affairs. Using mouthguards to reduce the incidence and severity of sports-related oral injuries. J Am Dent Assoc. 2006 Dec. 137(12):1712-20; quiz 1731. [Medline]. Echlin PS, Upshur RE, Peck DM, Skopelja EN. Craniomaxillofacial injury in sport: a review of prevention research. Br J Sports Med. 2005 May. 39(5):254-63. [Medline]. [Full Text]. Romeo SJ, Hawley CJ, Romeo MW, Romeo JP. Facial Injuries in Sports: A Team Physician's Guide to Diagnosis and Treatment. Phys Sportsmed. 2005 Apr. 33(4):45-53. [Medline]. Stackhouse T. On-site management of nasal injuries. Phys Sportsmed. 1998 Aug. 26(8):69-74. [Medline]. Kaufman BR, Heckler FR. Sports-related facial injuries. Clin Sports Med. 1997 Jul. 16(3):543-62. [Medline]. Svider PF, Chen M, Burchhardt D, O'Brien PS, Shkoukani MA, Zuliani GF, et al. The Vicious Cycle: Pediatric Facial Trauma from Bicycling. Otolaryngol Head Neck Surg. 2016 Feb. 154 (2):371-6. [Medline]. Hojjat H, Svider PF, Lin HS, Folbe AJ, Shkoukani MA, Eloy JA, et al. Adding Injury to Insult: A National Analysis of Combat Sport-Related Facial Injury. Ann Otol Rhinol Laryngol. 2016 Aug. 125 (8):652-9. [Medline]. Bobian MR, Hanba CJ, Svider PF, Hojjat H, Folbe AJ, Eloy JA, et al. Soccer-Related Facial Trauma: A Nationwide Perspective. Ann Otol Rhinol Laryngol. 2016 Dec. 125 (12):992-996. [Medline]. Massimiliano B, Nicola S, Sante B, Carmela F, Palmieri V, Paolo Z. Female boxing in Italy: 2002-2007 report. Br J Sports Med. 2011 Jun. 45(7):563-70. [Medline]. Lawson BR, Comstock RD, Smith GA. Baseball-related injuries to children treated in hospital emergency departments in the United States, 1994-2006. Pediatrics. 2009 Jun. 123(6):e1028-34. [Medline]. Day C, Stolz U, Mehan TJ, Smith GA, McKenzie LB. Diving-related injuries in children Pediatrics</i>. 2008 Aug. 122(2):e388-94. [Medline]. Green JI. The Role of Mouthguards in Preventing and Reducing Sports-related Trauma. Prim Dent J. 2017 May 1. 6 (2):27-34. [Medline]. Altundasar E, Demiralp B. The importance of soft tissue examination in post-traumatic decision-making: a case report. Aust Endod J. 2013 Apr. 39(1):35-8. [Medline]. Curtin JW. Basic plastic surgical techniques in repair of facial lacerations. Surg Clin North Am. 1973 Feb. 53(1):33-46. [Medline]. Beam JW. Tissue adhesives for simple traumatic lacerations. J Athl Train. 2008 Apr-Jun. 43(2):222-4. [Medline]. [Full Text]. Coto NP, Meira JB, Brito e Dias R, Driemeier L, de Oliveira Roveri G, Noritomi PY. Assessment of nose protector for sport activities: finite element analysis. Dent Traumatol. 2012 Apr. 28(2):108-13. [Medline].